Hei, jatketaan näitä digileimakortteja, niin saan yhden tiedoston tuhottua! Pari lumiukkokorttia vuorossa, kuvat väritetty Promarkereilla ja säläpapereita käytetty. 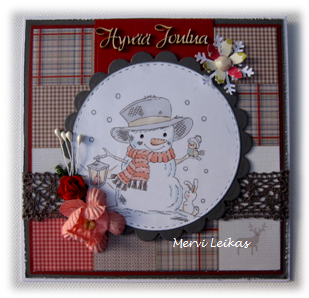 Hi, more Christmas cards with Di's Digis images, now two snowman cards coloured with ProMarkers. I used some left over papers. That is one great snowman and love your papers and choice of colours. Love the patchwork background, what a great idea for using scraps, I've got tons!! Very cute and well designed cards.